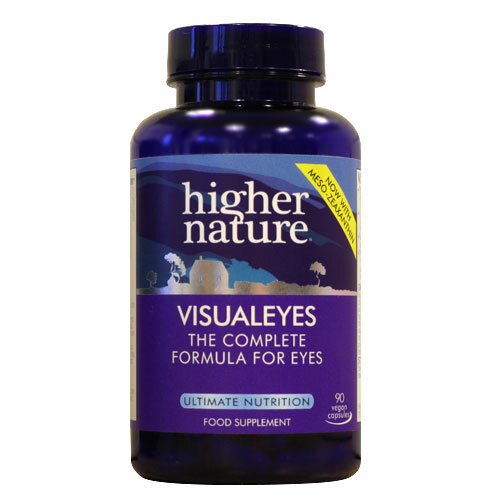 New and improved - a comprehensive eye health formula containing DHA, vitamins A, E, C, B2 and meso-zeaxanthin. VisualEyes contains all three macula carotenoida including meso-zeaxanthin and is ideal for those using blue light screens. DHA, vitamins A, B2 and zinc all contribute to the maintenance of normal vision. Docosahexaenoic acid (DHA) powder (antioxidant: dl-alpha tocopherol), capsule: hydroxypropyl methylcellulose; meso-zeaxanthin complex (from tagetes erecta L [marigold]) (antioxidant: d-alpha tocopherol), bulking agent: cellulose; lutein complex (from tagetes erecta L [marigold]), zeaxanthin, ascorbic acid, vegetarian magnesium stearate, zinc citrate, d-alpha tocopheryl succinate, anti-caking agent: silicon dioxide; vitamin A acetate (stabiliser: corn dextrin, anti-caking agent: modified starch, antioxidant: dl-alpha tocopherol), riboflavin, vaccinium uliginosum (bilberry) extract. Adults take 1-2 capsules a day (children over 12 take 1 capsule a day), with meals, or as your health professional advises. Food supplements should not be used as a substitute for a varied and balanced lifestyle. Below are reviews of VisualEyes - 90 Capsules by bodykind customers. If you have tried this product we'd love to hear what you think so please leave a review. I have been taking Visual Eyes for over a year, whilst receiving Specialist treatments for Wet Macular Degeneration. 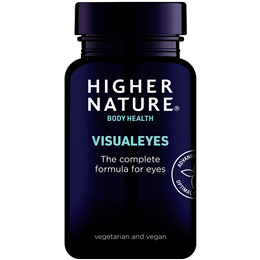 There has been a truly amazing improvement in my vision, not only have the specialist treatments reduced swelling in the eye but the eye chart tests have improved dramatically, I am sure this supplement has been very beneficial to the overall health of my eyes. I have just completed my 30 tablets, but honestly cannot say that I have experienced any great improvement in my vision. I am still getting blurred vision. I do not know whether to repeat the treatment or not. At over 70 the last eye exam picked up a slight onset of age related non wet macular degeneration as well as a bit of cataract growth. This product has certainly helped my eyes as the latest eye exam showed (if anything)an improvement with my eyesight and general eye health. I will continue use of VisualEyes as well as keeping an eye (no pun intended) on my diet and general health. As an integrated medical health practitioner I am only too happy to recommend Body Kind and this product as a helpful as well as preventative supplement. I have tried various "natural" medicines for the eyes - each containing lutein + various other useful ingredients. None did anything observable - except that my eye didn't get worse - which is not insignificant! When I started on Visualeyes by Higher Nature things seemed to be slowly improving. Now my symptoms have disappeared!